Runoffs are spectacular affairs for the opposing party. Dr. Greg Brannon is in the news today for his 2-day, 8-city campaign kickoff. The stuff on his website is typical tea-party fare. Even though he’s never held elected office, I’ve stated before that he should be taken seriously. To dismiss him as a fringe candidate outright is a recipe for disaster. In today’s Tea-Party dominated Republican Party, lack of prior experience in politics is often a plus. Nevertheless, I’ve said about all there is to be said about the good doctor. Obviously it’s only February, so we’ll just have to see how things play out. For now, here’s a general rule for Republican candidates opting for the Senate: avoid runoffs. Runoffs are often contentious, result in depleted campaign funds, and has the potential to divide the party while increasing negatives for both candidates. 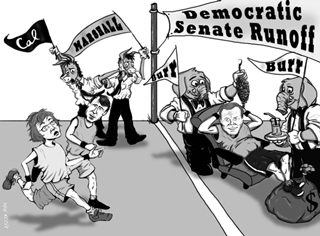 This is especially true when running against an incumbent senator. Incumbents are constantly raising money. No matter what, Senator Hagan is likely to have a huge warchest. Spending money in a runoff is just a waste. There has been legislation proposed that might end runoffs in North Carolina. Unlike most states, candidates only have to reach 40% to become the nominee outright. But last year’s runoff elections had such dismal turnout that some are saying we should do away with them altogether. There was one precinct in Raleigh where no voters showed up. In a time where politicians are always trying to save money, ending runoffs might be a successful bipartisan proposition. One thing’s for certain: Kay Hagan would be opposed to such a measure. She’ll be in a tight race, and no matter who the nominee is, a heated runoff election would swing the pendulum in her favor. The only thing in doubt is which type of Republican candidate would benefit from an end to runoffs. Obviously it would be those candidates who have significant support but would have trouble winning a majority of North Carolina Republicans outright. Could ending runoffs be a boon to establishment candidates, who often have more money and name recognition, but often shrivel up under the Tea Party microscope? Only time will tell.